This week we have seven new libraries that are all quite unconventional in their own ways. We have drums kicks that originate from sounds of a bridge, electric typewriters both in and out of operation, lots and lots of babies, mechanisms that work off steam and gas, clocks, fountains of all sizes, and synthesized emotions. '100 Fountains' by Articulated Sounds features plenty—100 to be exact—distinct fountains from above ground and underwater. These fountains are of all shapes and sizes with large tiered granite basins, heavy jets in a lake, water spilling into a pond, babbling zen gardens, drinking fountains and more. Each of the 100 files is between 40 sec and two minutes long, and they are fully loopable which is a godsend to game sound designers. If you need variations of water that can't be found in nature, this is the library for you. 'Baby Boom' by BOOM Library features over 150 sounds of these (often difficult) little voice actors. These vocalizations come from baby girls and boys between the ages of 3 months to two years, and they emote using what effective sounds and limited words they know. The babies cry, cough, babble, laugh, scream, gurgle, and whine, and with such detailed metadata such as 'Awoowoo' 'Neyaneeya' and 'Iyahyeyyay', you'll be able to find the sounds you need quickly. For all your baby sounds needs, check out this library. 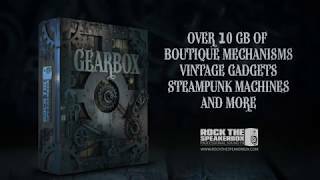 Get the sounds of mechanisms, Steampunk inspired gears, contraptions, metal and servos with the Mechanism sound effects library. Mechanism was created in collaboration with Sweet Justice Sound, Richard Devine, and SoundMorph, and we put great effort into ensuring the quality and usefulness of this unique collection. Half designed and half source recordings, Mechanism gives you a toolbox to be inspired by. It features more than 300 files – and right now you get a bonus 400 best-of-sounds from our Robotic Lifeforms library, for a total of 2.8GB of 24bit/96khz .WAV files. 'Mechanism' by SoundMorph and Sweet Justice Sound is a collection of 300 sounds of Steampunk-inspired contraptions such as mech arms, mechanical locks, steam levers, gas explosions, cranks, and plenty more. Certainly this is a unique library! The collection also includes 400 'best of' sounds from the 'Robotic Lifeforms' library. If you're looking for quirky mechanical sounds, give this library a listen. 'Clink' by echo | collective is a pack of over 40 clock sounds captured from the Herschede Starville clock. This library features manual and servo winding, lever bounces, metal clicks, and other mechanisms in these timekeeping devices. The library also includes an NI Battery kit that sweetens the tracks with transient enhancement, EQ, delay and compression. For sounds that go beyond the standard 'tick, tock', check out this library. When you need Electric Typewriters Sounds, this composite SFX collection of 4 and half (yes half, one machine was broken) (old) electric typewriters delivers. You will find sounds ranging from opening/closing covers, pressing keys, random typing, electric motor movements of the writing head, mechanic-hammering of the letters, small mechanical levers and more. Of course the sounds can be used for interfaces (and, well, electric typewriters!) – but they could also easily be mangled and mutilated for some great robotic and futuristic stuff. Try it yourself. All sounds were recorded with a Sennheiser MKH8050 through a UA Apollo 8 and a RODE NTG-3 through a Sound Devices 744T. All sounds are royalty free. 'Electric Typewriters' by SoundBits is a collection of almost 500 sounds of, you guessed it, electric typewriters—more specifically 'four and a half' typewriters, as one was broken. This library features every part of these machines' bodies with their hammer mechanisms, electric motors, keystrokes, and hatches. 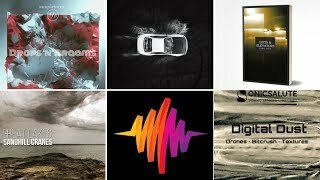 These sounds are great for UIs, and since they were recorded at 96kHz, they can be stretched and mangled as the sounds of robots and other futuristic machines. For the clicks and clacks of a device that moved modern technology forward, listen to this library. 'Gravitas' is the fourth and final collection in Eiravaein Works' series of nontraditional drum libraries. This library features the kick drum, which has been realized with layers of recordings of bridges and their locations. 'Gravitas' includes 400 variations of these composited and intricate sounds, which will surely add an interesting layer to your sound. If you want an organic, experimental sound in your music, this is the library for you. 'Synthesized Moods' is a collection 18 synthesized moods by SoundFxWizard. 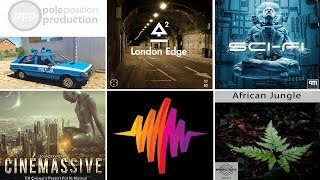 These abstract sounds mimic various emotions and scenarios like 'singing robots', 'crime scenes', and 'crowd interference'. This library is also available in two forms—audio-only or including NI Massive presets that allow you to take advantage of macro-control and NI metadata. If you're seeking something that straddles the line between music and sound design, give this library a listen.